Service-oriented nurse with thirty-five year history of employment with HonorHealth and its preceding organizations. While bedside nursing was the initial focus of work, I moved into management and development of a fully accredited rehabilitation unit. Over the following years, I obtained additional experience and expertise in case management, social work, compliance, and review of Medicare denials. Most recently I have developed computer entry and quality improvement skills. Core competencies include patient communication, physician communication, and regulatory aware3ness skills, as well as excellent data management and time management skills. Handles tasks with accuracy and efficiency. Quality Consultant May 2013－Present HonorHealth － Scottsdale, AZ Maintained the National Quality Improvement Project data base for the HonorHealth Osborn campus. Abstracted medical records of surgical patients and entered predefined outcome measures. Made 30 day follow up phone calls to patients and physician offices. Participated in leadership meetings to deesign improvement projects for surgical procedures. 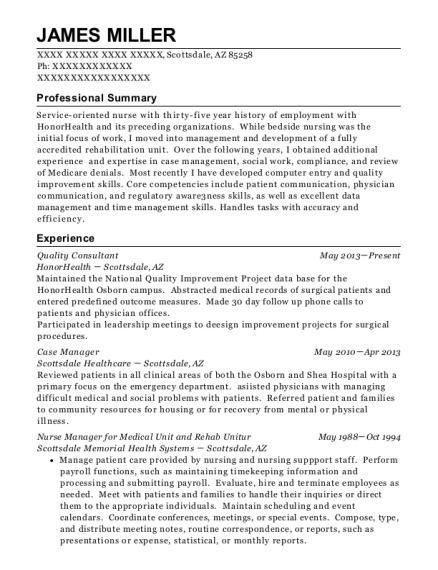 Case Manager May 2010－Apr 2013 Scottsdale Healthcare － Scottsdale, AZ Reviewed patients in all clinical areas of both the Osborn and Shea Hospital with a primary focus on the emergency department. asiisted physicians with managing difficult medical and social problems with patients. Referred patient and families to community resources for housing or for recovery from mental or physical illness. Manage patient care provided by nursing and nursing suppport staff. Perform payroll functions, such as maintaining timekeeping information and processing and submitting payroll. Evaluate, hire and terminate employees as needed. Meet with patients and families to handle their inquiries or direct them to the appropriate individuals. Maintain scheduling and event calendars. Coordinate conferences, meetings, or special events. Compose, type, and distribute meeting notes, routine correspondence, or reports, such as presentations or expense, statistical, or monthly reports. Monitor, record, and report symptoms or changes in patients' conditions. Record patients' medical information and vital signs. Inform physician of patient's condition. Administer local, inhalation, intravenous, or other anesthetics. Direct or supervise less-skilled nursing or healthcare personnel or supervise a particular unit. Perform shift supervisor functions. 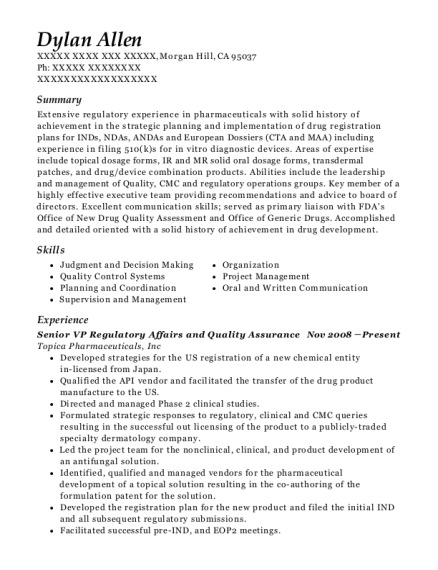 This is a resume for a Quality Consultant in Scottsdale, Arizona with experience working for such companies as HonorHealth and Scottsdale Healthcare. 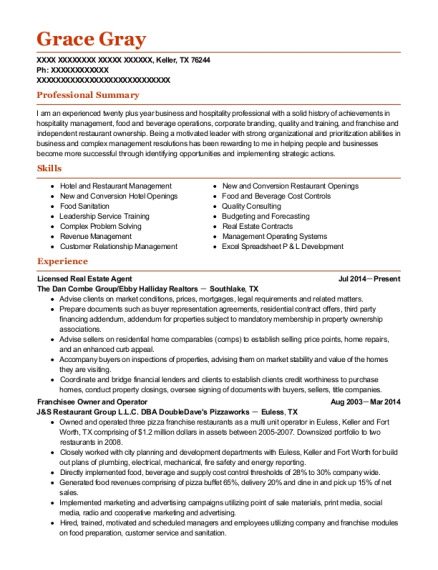 The grade for this resume is 0 and is one of hundreds of Quality Consultant resumes available on our site for free. 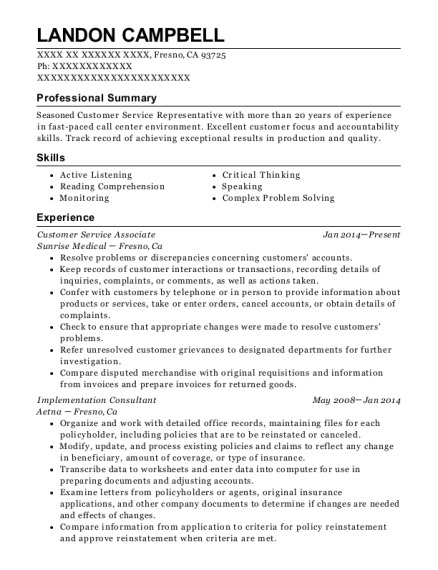 Use these resumes as templates to get help creating the best Quality Consultant resume.